los angeles vegans know this very well: edible sushi usually consists of a stale avocado roll, some slices of cucumber, and if you are lucky, maybe some deep fried tempura vegetables. well that’s just not the case at tomo sushi. 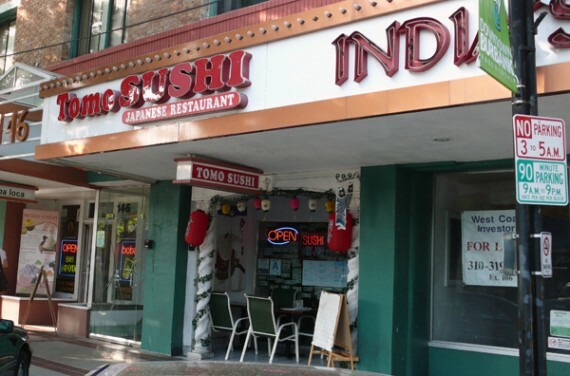 located in burbank, tomo sushi is your typical hole-in-the-wall sushi establishment with its cute bar, authentic menu, friendly staff, and canadian-brewed japanese bottled beer. except tomo sushi does one thing different: they offer an entirely vegan sushi selection in addition to the fish-filled standards. and i’m not talking just any old ‘boring’ vegan selection, tomo boasts over 20 entirely animal-free sushi rolls filled with vegetables, tofu, potatoes, and more vegetables that i can’t pronounce. i hit up tomo sushi last night with my husband, and while ordering our carefully selected vegetarian rolls, we let our server know we were vegan. i think he took this info as a challenge, and insisted that he bring out some ‘chef specials’. we complied and ended up with a most amazing selection of vegan sushi. tomo pulled no stops when they presented us with the fresh garlic rolls, japanese mountain potato sushi, japanese mushrooms and chile tempura. 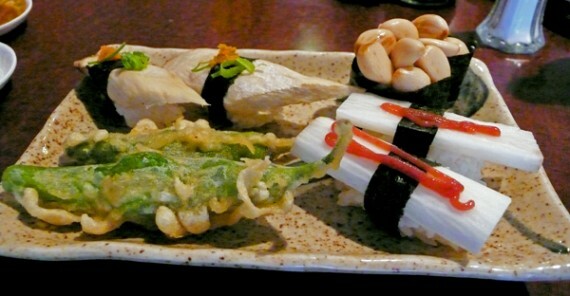 garlic rolls, japanese mountain potato, japanese mushroom and chile tempura. every bite of the above was like a flavor explosion in the mouth. i don’t even think this stuff is on the menu, but it was the highlight of our meal. seriously, if you ever dine at tomo, please ask the chef to make you something vegan and special. i’m not sure how much it cost, but whatever the price tag was, it was well worth it. 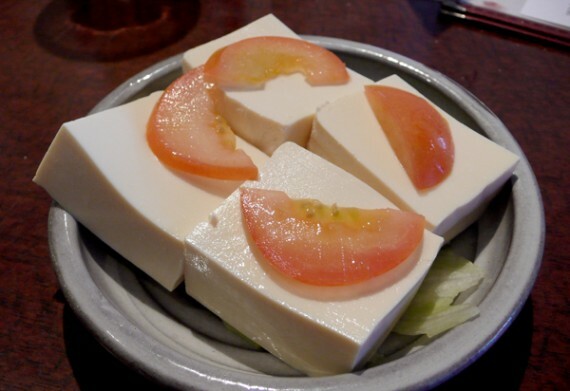 as an appetizer, we shared the cold tofu which was basically four large blocks of silken tofu topped with chilled sliced tomatoes. when it arrived at the table i thought it looked kinda boring, but when i tasted it i realized i’d forgotten how damn good simple tofu can be. this stuff was top notch, and dipped in copious amounts of wasabi and soy sauce, it tasted incredible. we also split a kimchi roll, which was pickled cabbage all rolled up in nori and rice. 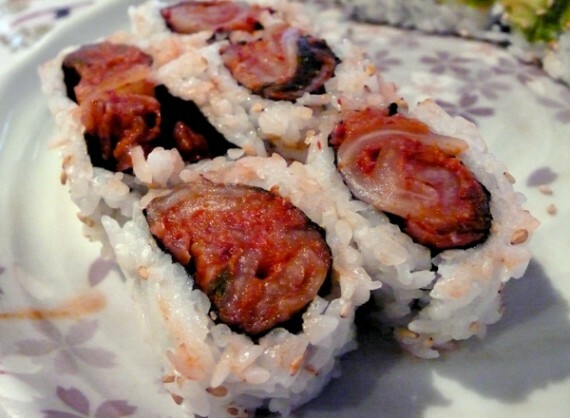 i’ve never had kimchi sushi before…it was mushy, sour, and really flavorful. definitely worth a try. next we shared a caterpillar roll, which consisted of mushroom, squash, carrot, asparagus, and pickled greens rolled in rice topped with sliced avocado. the vegetables in this thing were absolutely amazing and the cool creamy avocado added to both the taste and presentation. 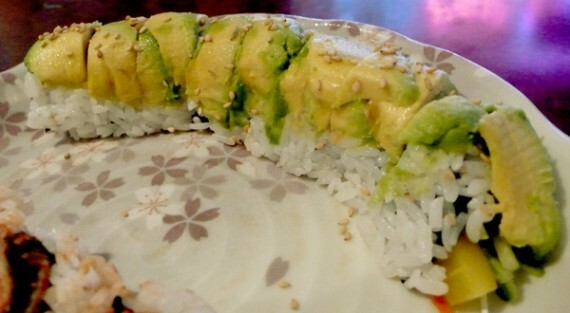 i was a huge fan of the vegetarian caterpillar roll, tomo took a traditional sushi dish usually made with eel and created an absolutely delicious cruelty-free version. order this if you are in the mood for something decadent. we also ordered the fried tofu roll—lightly fried tofu wrapped up with asparagus and scallions. this was the only one of our rolls with warm and cold ingredients, and it made for a pretty interesting taste sensation. the tofu was fried just perfectly, not too much, but enough to be crispy. i would definitely order this sucker again. once again proving that tomo loves vegans, at the end of our meal, our server brought us a complimentary plate of vegetables prepared by the chef. the dish consisted of cucumber slices topped with beet pate and thinly sliced shreds of japanese mountain potato. all of it was fatastic…seriously, never underestimate the deliciousness of simple ingredients when artfully prepared. 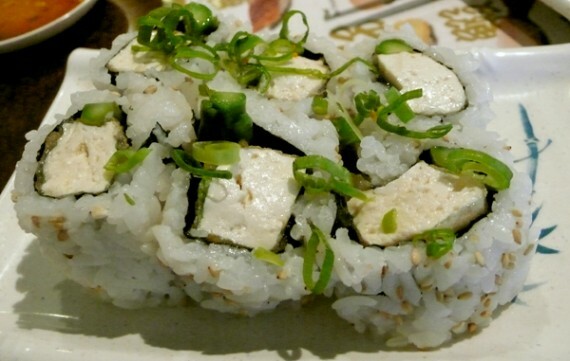 other than shojin, the entirely vegan japanese restaurant in downtown, i’d say tomo is definitely the most vegan-friendly place to get sushi in los angeles. i know i will be back to try more of their creations such as the oshinko, mountain vegetable, & fotomaki rolls, and hopefully try some more specially-made vegan sushi from the chef. the staff is super friendly, the food is good, and the atmosphere is chill. a+! 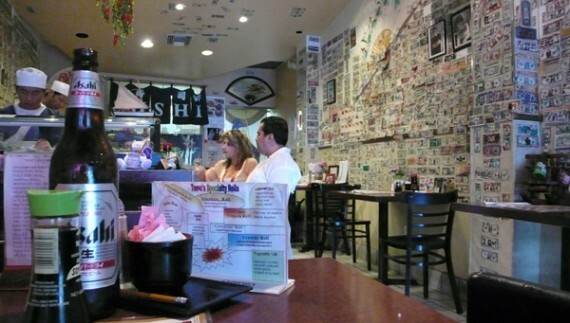 as far as the decor goes, i guess tomo couldn’t decide what color to paint their walls, so they took $1 bills from customers hung up all over the restaurant. cuuuuuuute. most of the money has doodles or a message written on it in brightly-colored ink. i love it. i was gonna add to the wall, but i’m too damn cheap to give up a dollar. in closing, my only gripe about tomo is, the bill can add up very quickly. the food pictured above plus two rounds of drinks ended up setting us back over 70 bucks. for stuff that leaves you feeling hungry a few hours later, that’s pretty damn pricey. oh well, i guess sushi in general is just really expensive, and this stuff was damn good so we didn’t mind paying. if you are on the hunt for some fish-free sushi that consists of more than chopped cucumber and avocado rolls, tomo is definitely your place.